Collected across continents and easily grown in Alaska, the primrose is a rich, often-overlooked addition to any northern garden. The name primrose is the common term for the genus primula (and unrelated to the evening primrose), of which there are nearly 500 hundred species of annuals and perennials. "Prim" derives from the word "prime," meaning "first," and indeed, primroses are often the first spring bloomers. The primrose is an alpine plant that originated in the Sino-Himalayan area, but several species are indigenous to Alaska. P. borealis blooms in snowmelt, while other varieties can be found across the windswept Seward Peninsula. There are almost as many reasons as there are primrose species as to why you should consider growing this easy plant in your garden. But the best reason, according to Juneau primrose expert Robert Tonkin, is that "they work, and in Alaska, darn few things do." The primrose is hardy and comes in all shapes, sizes and colors. It doesn't mind cooler temperatures, and some grow as far north as Zone 2. The early-blooming varieties add color to a spring scene, and moose don't like them. The flowers have a strong and varied visual appeal. Some are tiny and subtle, appropriate for rock gardens, while others make a more dramatic appearance. P. denticulata, for example, are often called "drumstick" primrose, as their round, full blooms bob on thin stalks, like drumsticks. Mary Jo Burns, an Anchorage primrose expert, likes her blooms "big, beautiful, and prolific," so she's cultivated an array of Himalayan primrose that self-sow and multiply quite easily. She recommends several of her favorite varieties, including early and mid- to late-bloomers. Burns loves P. auricula, which is "the most hardy and easiest to grow," of all her favorite varieties for Alaska gardens. 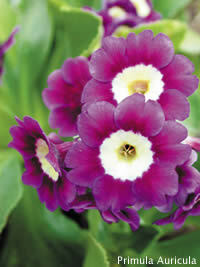 Auricula are adorned with bright yellow centers, with petals that range from deep purple to white. To the untrained eye the bloom might at first resemble an African violet, but the center is much larger and the flowers contain more petals. P. juliana hybrids are "happy, bright little flowers" that grow robustly and do well in Anchorage. They are early bloomers as well, but tend to flower after auricula. A mid-season bloomer is P. sieboldii, which has been hybridized in Japan for over 400 years. Burns claims the flower will "tickle your fancy with beautiful, rich, and wonderful blossoms." This creeping, deciduous plant produces blooms in purple, magenta, red, pink, and white and goes underground if it gets too hot – make sure to mark it. Finally, a late-blooming primrose that is "wonderfully fragrant" is the P. alpicola. The tall, slender stalks bloom in July and reach nearly two feet when doing so. "Almost all primula are quite fragrant," reports Burns, "but they are too low to the ground to sniff." Alpicola, by contrast, are tall enough to catch a breeze that will disperse their fragrance. New technology such as cell culture – duplicating plants from cells – means that once-rare primrose are now showing up in the marketplace. But consider starting out with the more common and easy varieties listed above. Most Alaska nurseries carry primrose, and though they're easy to sow from seed they also transplant easily so it's no problem to purchase a start. 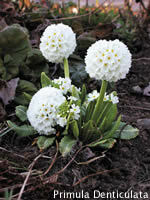 The American Primrose Society's webpage (americanprimrosesociety.org) is full of useful information, and the Alaska chapter (alaskaprimroses.org) contains a wealth of tips relevant to Alaska gardeners.